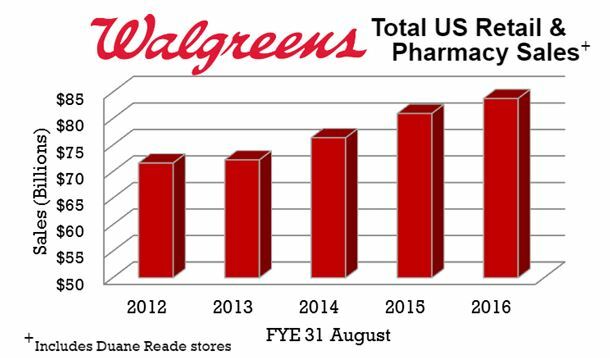 Walgreens Boots Alliance released its fourth quarter and fiscal year end (31 August 2016) results last week. Executives also took the opportunity to announce that the deadline for the company’s acquisition of Rite Aid has been pushed out but they fully expect to close the deal in the beginning of 2017. The highlight of the earnings announcement for investors was the better-than-expected fourth quarter net earnings number which was north of $1 billion. Total sales for Walgreens Boots Alliance were up 13.4% for the year to reach $117.4 billion, a percent increase that was helped along by the inclusion of Boot Alliance numbers for the entire period. Focusing in on U.S. sales, Walgreens and Duane Reade stores combined for a 3.5% year-over-year increase to $83.8 billion. Source: Chain Store Guide Database of Drug Store & HBC Chains. 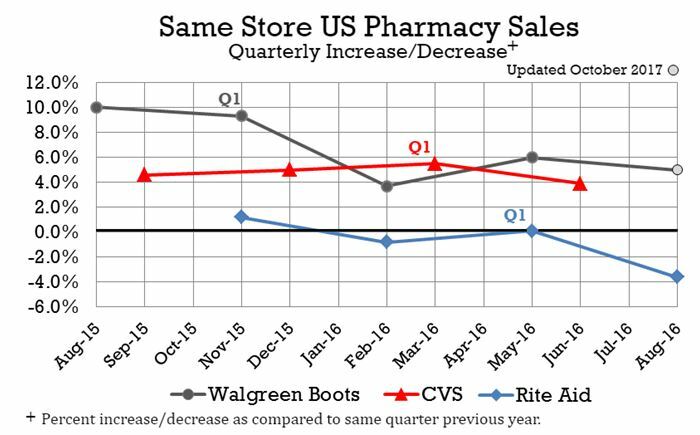 Same-store US pharmacy sales were up 5% in the fourth quarter when compared to Q4 2015, reflecting the slowdown in pharmacy sales growth we’ve seen over the summer at CVS and Rite Aid (we’ve updated last month’s chart below). For the year, same-store pharmacy sales were up 6% and overall comparable store sales were up 3.8%. Sources: Chain Store Guide Database of Drug Store & HBC Chains and company reports.